Until recently, I viewed myself simply as an early-career PhD researcher in Food Policy. It didn’t occur to me that I was (professionally-speaking) much more than this. Then my first teaching role was bestowed upon me and something changed… Through taking my first academic practice training module as a requirement for the role, suddenly I was guided to the realisation that -gasp- I wasn’t just a researcher in food policy, but was studying to be a hatchling lecturer! All the research, pedagogy theory, and practice backing HE teaching was a whole other side to the academic role that I hadn’t even thought of! 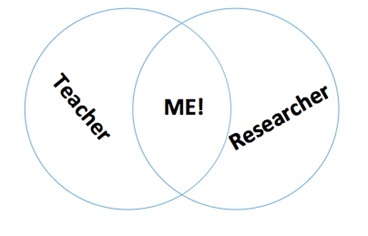 Suddenly, I am both researcher and teacher, developing myself professionally in both of these areas… A multi-dimensional academic exploring different roles and spanning disciplines!! …. ….I am a Venn diagram of my own surprise and excitement! As such, I’m a newcomer to the HEA world. I am new to the ideas, the approaches, and the community, and it is exhilarating (really) to feel like a part of something in addition to and complementary to my research role. I have been, perhaps naively, surprised at the conference to find out that there is an uneasy duality for academics in these two roles. Additionally, as a Canadian and newcomer to the UK, I’m also learning a great deal about the UK school and university system. My professional formation as a HE educator has been supported by the Learning Enhancement and Development (LEaD) program at City University, which links to the HEA. Programs or organisations like these are simply not a part of the Canadian HE training scheme for graduate students. This training and guidance during my master’s may have saved me from a) trauma of blank faces of unengaged undergrad students, b) insisting that I would never be a prof because of said trauma, and c) the confidence hit from thinking I was terrible at teaching. Let’s face it, it also would have saved dozens of students the boredom of my unskilled, untrained early lectures. Before taking the academic practice module with LEaD, I’d never given much thought to the how of teaching at the university level. It never occurred to me that the lecture format was one of many available options, or that there were clever people researching and thinking of better ways to do this. Thankfully, things have turned around in that regard and teaching UG students has been (somewhat) demystified! I find my default, like many of you, is to give a lot of myself to my students – be it imparting my experience, providing guidance that I felt was lacking in my undergrad degree, or simply giving time. So something about being suddenly a part of the academic world that is designed to give students the best experience and chance to reach their potential is hugely appealing and empowering to me. Through this, I see an opportunity to develop my skills as a lecturer, my confidence, and my career, and make it a richer experience for my future students. I come to the #HEASocSci15 Inspire conference with a fresh pair of eyes to this world, and I have indeed felt inspired. Previous: Are we sitting comfortably? Let’s begin. Inspire - teaching and learning in the Social Sciences by Daphne Page is licensed under a Creative Commons Attribution 4.0 International License, except where otherwise noted.